Reform of the National Flood Insurance Program remains an unresolved issue. Congress must reauthorize the debt-ridden Federal Emergency Management Agency-managed program by March 23. It already has had several short-term extensions since September, when the program was roiled by record hurricane claims in late 2017. Insurers continue to keep NFIP renewal and reform high on their agendas. 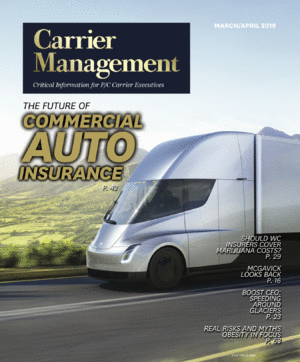 Carrier Management spoke about the issue with Charles Chamness, president and CEO of the National Association of Mutual Insurance Companies, at the III Joint Industry Forum in New York earlier this year. He also sounded off on a related issue: disaster recovery reform—a bid to improve how the government spends on disaster mitigation efforts. Chamness and NAMIC are seeking a number of changes in how the government handles flood insurance. “Our concern is, and our objective is, to get reform in the system, to bring rates up to actuarial levels,” Chamness explained. But NAMIC also wants more flood mitigation efforts, a reduction of repetitive loss in the program and to get the NFIP on a firmer financial footing after years of deficits. Beyond the historically damaging hurricanes that struck last fall, the U.S. dealt with record catastrophes that also included wildfires and other weather events. Chamness said these disasters show that the U.S. needs to reform how it responds to these events and spends money to address them. But Chamness said the process is political and wasteful, in terms of government spending and insurance. He wants more done to help people mitigate against future loss.